This isn’t the first time I’ve used this chocolate cake recipe and added a twist to it. It’s very versatile that way. Instead of adding 1 cup of boiling water in that last step, substitute it with 3/4 cup of Cola and 1/4 cup Jack Daniels. I made mini cupcakes so I baked them at 350°F for 18 minutes. Preheat oven to 350°F. Line 24 cupcake tins. Stir together sugar, flour, cocoa powder, baking powder, baking soda, and salt in a large bowl. Add eggs, milk, oil, and vanilla and beat on medium speed, scraping sides of the bowl. Stir in Cola and Jack Daniel’s (batter will thin). Spoon into prepared tins and bake for 17-20 minutes. Prepare the Ganache: Place chocolate in a heavy proof bowl. Scald the heavy cream in a sauce pan. Do not boil. Pour hot cream (grow up!) over chocolate. Let it melt a bit before whisking it. Add Jack Daniel’s to taste and whisk to well combine. 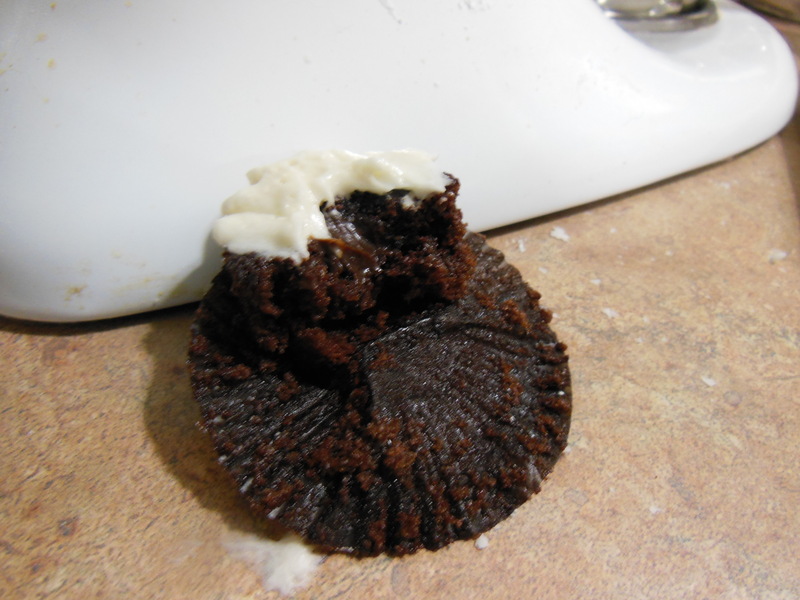 Scoop out a hole in each cooled cupcake and pipe the ganache into it. Pipe your own basic butter cream on top (though I did add a little bit of Cola into the frosting not that it really makes a huge difference though it did give it that frothy colour). 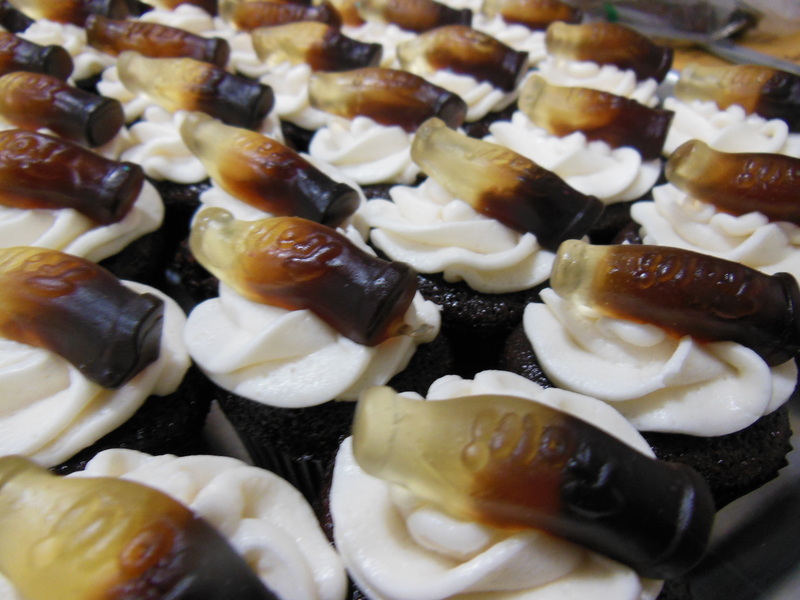 Top each cupcake with a Cola gummy and serve! Sure, the Coke flavour doesn’t pop (I’m working on it) but the JD does while having the chocolate cake tone it down. If you discover a way to truly make a Coke flavour cake, I’d love to hear it! To make the cake or frosting more coke flavored you can boil the coke and evaporate some the liquid so you just have the syrup left. Then add this syrup to the frosting with just a little bit more coke.